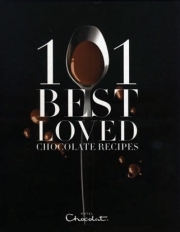 Commissioned by the retailer and luxury chocolate brand Hotel Chocolat, this book contains 101 mouth-watering chocolate recipes that have been personally selected by Consultant Jane Suthering (President of the Guild of Food Writers). The recipes – by an impressive range of food writers – are arranged by time of day, and span chocolate recipes for cakes, biscuits, desserts, drinks and even savoury dishes. They include favourites from celebrities such as Sophie Grigson, Phil Vickery and Michel Roux.